Natalie wrote in her Medium account today a heartfelt letter to Amos Oz. It’s worth reading. The news about Natalie pile up, so here are a few as Tidbits. They have been two intense weeks of ATOLAD promotion for Natalie. In that time we have seen many photos and videos of her public appearances … but if that was not enough, here are a couple more to complete it. A few days ago we saw the full interview to 92nd Street Y, today we can see the conversation at Aol Build New York. Natalie made another media appearance, this time for the Wall Street Journal Cafe, to promote ATOLAD. By now you might feel like you’ve heard enough about that project, so you might want to stick around for the end where Natalie talks about her non-involvement with Thor 3 (sounds pretty final), the Ruth Bader Ginsburg biopic and future directing projects. 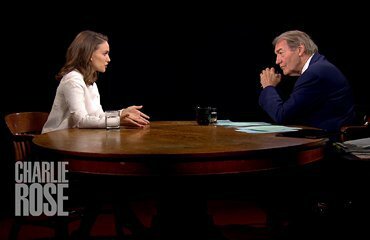 Here it is: the full interview with Natalie on the Charlie Rose’s program last night. Today was a great day to be a Natalie fan, certainly. After a couple of television appearances, here are a few pictures of the A Tale of Love and Darkness Premiere & After Party in New York.